Cyclesnack: Why am I riding a singlespeed again? My whole 29er experience, since 2006, has been riding singlespeeds. For the past three years I have been racing only singlespeeds, too, but ever since CT NEMBA's Happening at Huntington a couple of weeks ago and demoing two outstanding bikes, the Lynskey Pro29er and a Carbon Fiber Gary Fisher Superfly, and now riding my own geared 29er, which used to be a singlespeed, I can't believe what I have been missing. I used to say that riding a single speed was so much easier because you don't have to worry about what gear you are in, however, I think it's quite the opposite. While riding a single speed, I spend a lot of time mentally planning how I am going to ride a particular trail or climb a hill, but geared you just down shift when it gets harder to pedal and up shift when it's easier, meaning you get to enjoy more of the trail! I guess now I have to figure out how to get a full suspension 29er! I got to really test out the Dillinger while riding Haley Farm and Bluff Point with Thom, the guy who got the Dillinger running with gears and holy cow, what a fun bike! Riding a 29er with gears is soooo much fun! Climbing is just insane and I am only pushing a 1x9. The bike has so much get up and go! I will probably keep riding SS for racing but when I am just riding for fun, the go to bike is going to to be the Dillinger! Here is today's route. 12 Miles! This place is AWESOME! Buff Singletrack; technical singletrack; no fall line climbs; rollers, rollers everywhere; skinnies; just freaking awesome singletrack! After crossing the tracks and riding along side of them this area looked like it might part of an old rail yard. So, I went to the UNH LIBRARY, Government Information Dept. Historic USGS Maps of New England & NY, and took a look at the 1938 topo of New London (pictured above) and you can see not only was there a huge rail yard there but it even had a round house! Now I really want to come back in the fall or winter to see if there are any old foundations, especially of the round house and the turn table. 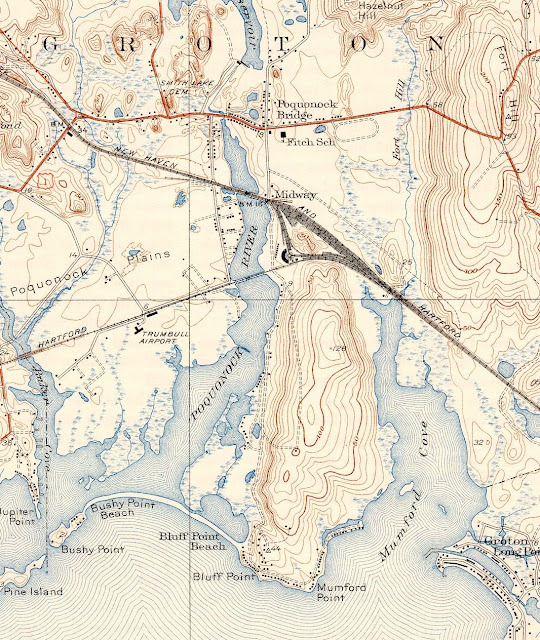 The funny thing is one topo shows all this, and the next one from the same year does not. The first one that shows the yard was done in 1934 and the second one was revised in 1949, my guess is all the iron for the rail yard was probably used for the war effort. The ride was awesome and I had so much fun that now I want to ride everything that I have been riding lately on the single speed. Mark, how many bikes do you own? Three mountain bikes, two fixed gears and two trail-a-bikes. Oh, and I forgot the Tandem, my wife's comfort bike that she has ridden once since I bought it for her, my daughter's still looking brand new Cannondale Chase and 4 kids bikes. Pretty big stable, when you think about it. Al, it depends on your strength and endurance. If you get a SS 29er, make sure you get a couple of different rear cogs and test your biggest climbs with it.